We have developed the Hive Scale Beescale4 (BS4). Simple and economical, it allows you to follow 4 different colonies in the same apiary. The comparison of 4 weight curves will give you all the elements of decision to best manage the swarming, feeding, enlargement and health of your colonies. BS4R – The standrad Version : weighs 4 hives individually and send the apiary’s temperature – ultra economical and easy to use. 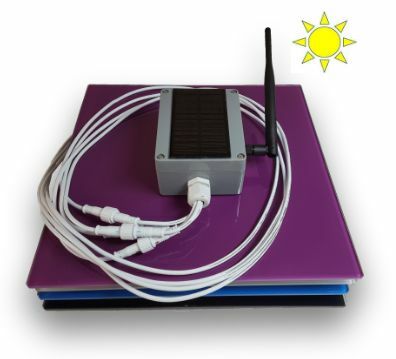 BS4M- The Moutain Version : has a remote box that can be placed up to 1 km, it will work even in the places most poorly covered by data networks. BS4X – The Multiple Version : weigh from 8 to 24 hives in the same apiary for a very competitive price. Thank to this 3 versions, you will covered all your needs. 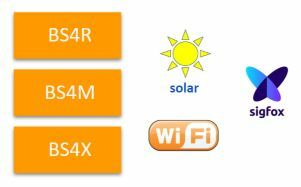 BS4R and BS4M balances can now be used anywhere in the world, for all apiaries with a wifi network less than 1KM. Thanks to the use of solar technology, recharging batteries is no longer necessary. The scales work without any maintenance. This feature is available as an option on all models. Wifi, Sigfox : coverage under roll out. Wifi, Sigfox : not available but we have a specifi solution for switzerland with LPN SwissCom, don’t hesitate to send us email. Most of country support Beekeeping equipment purchase ! Take time to find it out.